The Vacation Request module automates scheduling and de-scheduling of benefits such as Vacation or Paid Time Off. It automatically evaluates benefit requests based on seniority and availability and allows bumping and supervisor overrides. The Vacation Request module eliminates paperwork while maintaining critical staffing levels. It even permits employees to sell off benefit time. The Vacation Request system eliminates paper requests and circulation of vacation sheets, frees supervisors to do more important work, and provides unbiased application of corporate policies. Benefit Request Reports and Benefit Approval Reports can be generated in minutes for review. Supervisors with granted rights can quickly override system settings and approve requests. Denied Benefit Reports and Evaluation Override Reports, in addition to many others, provide administrators with quick oversight of system activities. When new time off requests are made, supervisors will be emailed informing them of the pending request. Once approved or denied, the employee can also receive an email in return. Each time off request is precisely recorded with the time and date of the request, allowing for fair, consistent and timely approvals. Supervisors are instantly alerted to new time off requests as they occur. The Vacation Request Automation module is a powerful benefit scheduling and de-scheduling system. It empowers employees to enter and review benefit requests and statuses. Vacation Request automation eliminates paper requests and circulation of vacation sheets, frees supervisors to do more important work, and provides unbiased application of corporate policies. Benefit Request Reports and Benefit Approval Reports can be generated in minutes for review. Supervisors with granted rights can quickly override system settings and approve requests. Denied Benefit Reports and Evaluation Override Reports, in addition to many others, provide administrators with quick oversight of system activities. 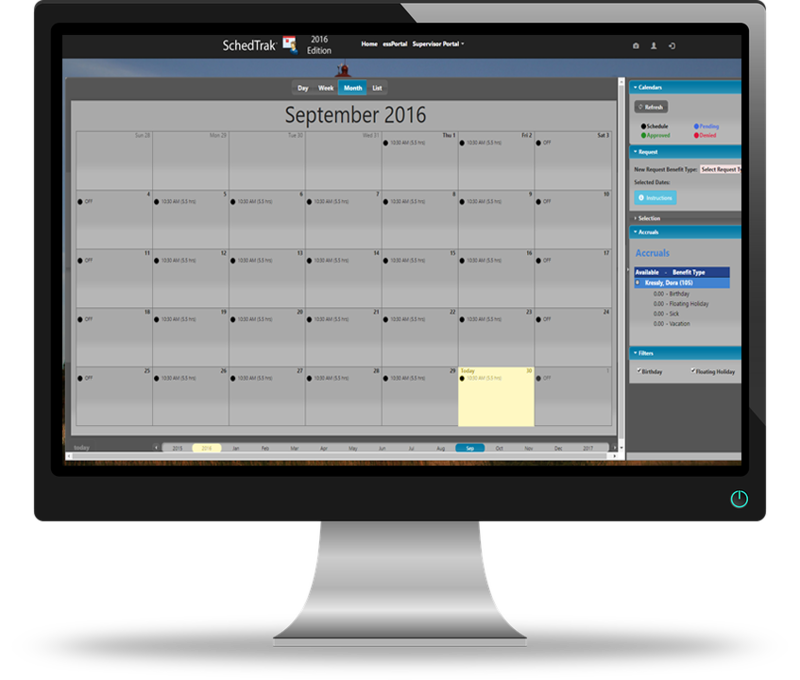 Employees have access to on-screen graphical scheduling at dedicated employee kiosks, or any workstation with access to the server on which TimeTrak resides. Employees may make requests to take benefit time such as vacation and comp time, review the status of requests pending, view current available hours and uncommitted hours (available less committed), and leave denied requests on hold pending a change in another employee’s schedule. The Vacation Request module also permits employees to sell off benefit time. The Vacation Request Automation module provides parameterized setup flexibility without customization. Structure automated evaluations and granting of benefit time requests to consider available/uncommitted time and seniority, among other items. Supervisors can designate minimum staffing levels by department, cost center, job, and many other criterias for consideration in granting or denying requests. Vacation bumping becomes an automated process, eliminating the continual manual restructuring of vacation schedules. In assessing available/uncommitted hours, the Vacation Request system takes the current balance in the Benefit Accrual Table and subtracts hours of that benefit type from other areas in TimeTrak not yet reflected in the balance. This yields an accurate gauge of benefit hours available, avoiding, for example, the possibility of approving a request for vacation hours this week that are already designated, by employee request, for a week-long vacation just two weeks from now. The Vacation Request system evaluates some requests daily, holds other employee requests until a set date, and permits supervisors to manually start an evaluation process. The system constantly monitors information 24 hours a day / 365 days a year and automatically evaluates requests according to your corporate policies. Each decision is detailed and stored for later review. Employee requests are never left unresponded to, the system handles them on a timely basis. Supervisors and potential biases are removed from the process, and all employees are treated fairly and consistently within your corporate policy – ensuring improved employee morale. Passing, completion, collection, and processing of employee vacation time sheets/requests consumes considerable supervisor time and energy, and yet often leaves employees disappointed and departments understaffed. It has been nearly impossible to effectively coordinate vacation scheduling in a manual method. Vacation Request Automation now permits you to fully utilize your system time and attendance information while reducing dependence on supervisors, getting the job done sooner and according to corporate policies.